Download SMART Funds Target Date Fund Index now. The SMART Funds® Target Date Index ("Index") is the first and only index that is focused on prudence and performance expectations for prudent TDFs, a growing segment of the TDF marketplace. 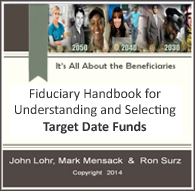 It is specifically designed for fiduciaries because fiduciaries want to make prudent decisions. Importantly, the Index remedies a current serious problem, namely prudent TDFs have lost the performance horse race to less prudent competitors because prudent characteristics have been detrimental to performance. For example, until this year diversification has been penalized. The new Index is a more pertinent standard that measures the intrinsic return to prudence. The SMART Funds® Target Date Index follows the patented Safe Landing Glide Path® (patent 8352349) that seeks to preserve the purchasing power of accumulated assets at the target date and to provide for the growth of assets during accumulation. The Index is managed "To" retirement using two Nobel Prize winning theories in a three phase process that invests in nine passive asset classes. The Index epitomizes prudence by emphasizing broad diversification at long dates, and stressing safety at the target date, with less than 10% in equities. Also, performance of the Index is net of fees. Importantly, the Index is investable as a collective investment fund for eligible qualified retirement plans through the NSCC Fund/SERV, and has a live track record that starts in 2014, backtested to 1998.